Though, according to some Egyptian botanists themselves, no gardens in Egypt is truly worthy of being objectively classified as “botanical garden”, we can still offer an official list of these institutions. PS: The feddan is 0,42 ha (4200 m2). Source: Ministry of Agriculture and Land Reclamation (Arab Republic of Egypt), 2006. View of Cairo, Egypt, photographed from a balloon at about 500 metres above ground. 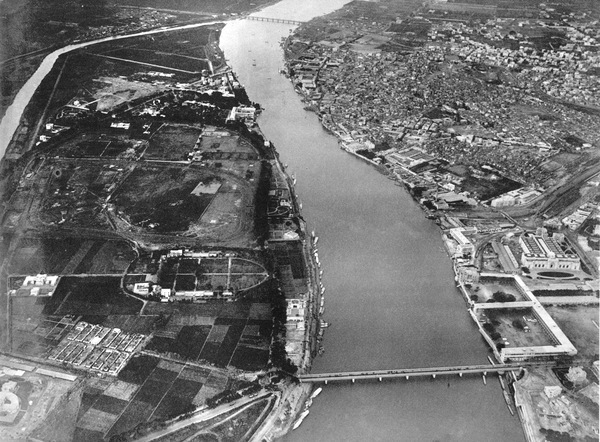 Left of the Nile are the Botanical Gardens and the race track, right are the British barracks and the Egyptian Museum. (Deutsch: Ansicht von Kairo, Ägypten. Links des Nils der Botanische Garten und die Rennbahn, rechts die Englische Kaserne und das Ägyptische Museum. Fotografiert aus einem Ballon aus ca. 500m Höhe). July 21, 1904; first published in Spelterini, E.: Über den Wolken/Par dessus les nuages, Brunner & Co, Zürich 1928, p. 81. This article has been read 3106 times. Dernière mise à jour de cette page le Wednesday 30 December 2015 à 23:55:40. //// -----> Citer cette page? Vincent Battesti, "Egyptian Botanical Gardens" [en ligne], in vbat.org anthropoasis, page publiée le 13 December 2009 [visitée le 22 April 2019], disponible sur: http://vbat.org/spip.php?article534.